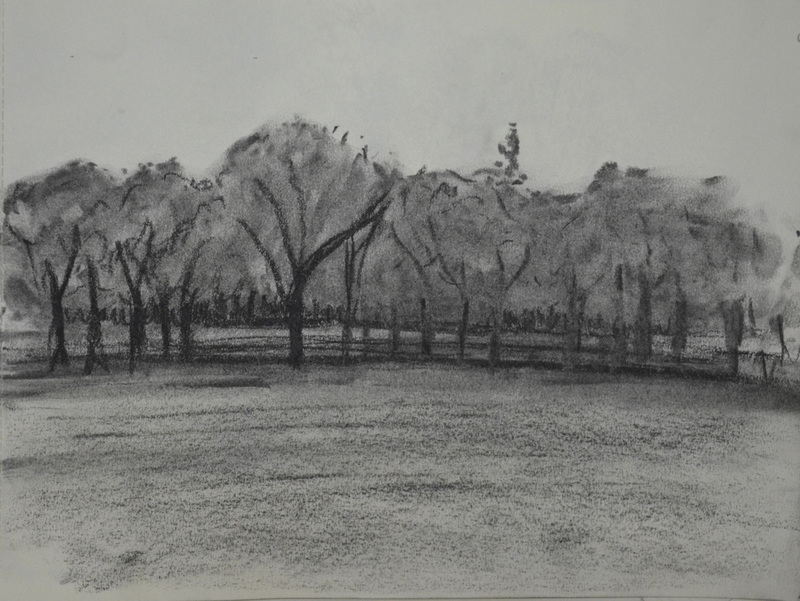 For this exercise I was to choose an expansive landscape where I had an open view in all directions, then using my viewfinder to find a focal point and to frame my view I was to complete a fifteen-minute drawing. From there I was to turn my stool on the same spot to face West, South and East, each time repeating the process of finding a focal point and completing another fifteen-minute drawing. 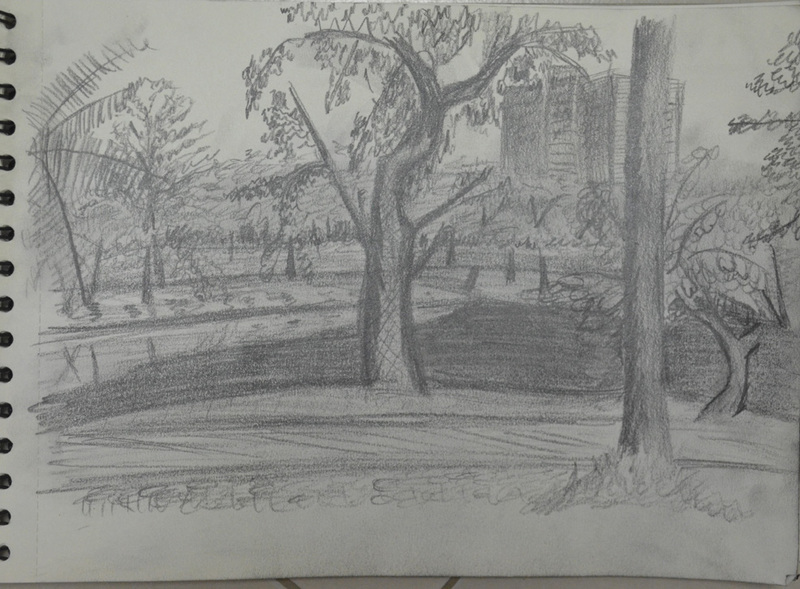 With not much choice of expansive Landscapes in Bangkok I knew I would be going back to the park where I did the sketches for the last exercise ‘A Sketchbook Walk‘ but I wasn’t sure when I would get the chance to go back. Then with a stroke of luck the Thai government tried bringing an ‘Amnesty Bill’ in so exiled former president Thaksin Shinawatra could come back Thailand without being strung up, so the protesters hit the streets again and I got three days off. Well to start with I didn’t have a stool and I would have looked a bit silly getting in the taxi with a buffet but it hadn’t rained for 2 days so I decided I would sit on the floor, so armed with my artist’s wrap, my A4 sketchbook, my small viewfinder and my small drawing board I headed to Suan Rot Fai again. I’d already decided where I was going to sit and I started drawing what I thought was North and what happened next was a series of accidents. It was pretty clouded and I was pretty positive the direction I was looking was south and there was no need to look at the GPS on my phone so I pulled out my charcoal pencil from my artist’s wrap and started drawing, two trees in I realised I had forgot my cutter and a pencil sharpener was just not going to do the job so I finished the drawing in compressed charcoal hence the two bushes in front of the trees in the background came out looking more like coal slacks than bushes. 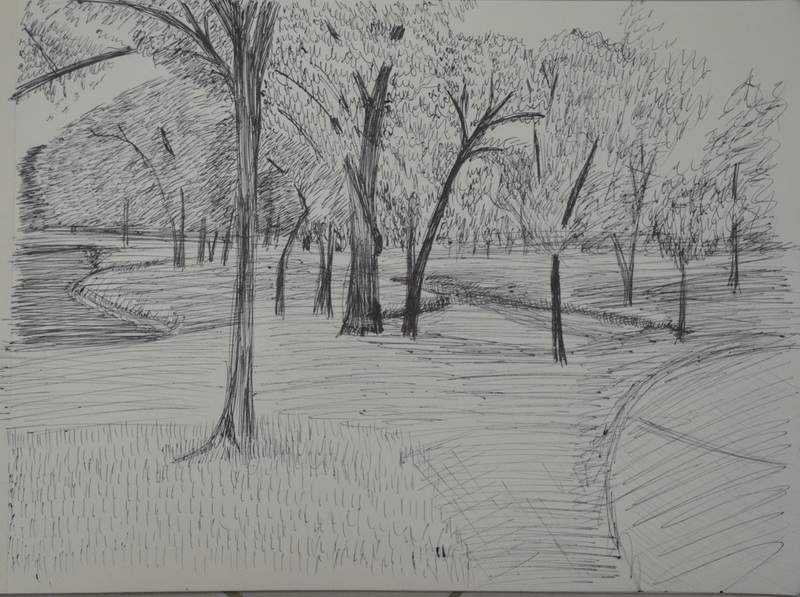 This first drawing did take me spot on 15 minutes and although I am not happy with the finished drawing as it looks more like Autumn in England than Rainy season in Thailand I thought I did quite well drawing the landscape with this medium for the first time. As I turned 90 degrees anti-clockwise to draw what I thought was West I realised that the Sun had come out from the clouds behind me and it was nearly three in the afternoon so I was actually facing East, I’m usually great at guessing where North is…however I decided to carry on. East was very tricky it was the first time I had drawn water and I was facing a lake so I chose not to carry on in Charcoal but to switch to a 4B pencil, a decision I now regret. Focusing on the tree directly in front of me, that looked like it was bending towards the water to get a drink, I began to draw. The whole process from beginning to end was a rush trying to finish in the 15 minute time frame and I was very lucky that it came out looking anything near the view I was drawing, I was going to leave the buildings in the background out but then decided to add them at the end. I wasn’t looking at the time but I reckon the drawing took me about ten minutes over the 15 minute time frame, the problem…too many trees! As I turned North to face more trees, I decided to switch mediums again and this time began to draw in my trusty ball point pen, even though the sun was shining by now and I think I depicted this quite well in the sketch, it probably does look more like an Autumn Scene. It took no time at all to sketch everything out but then another 15 minutes to get the trees looking anything like trees. I feel now that a fine marker would have been a better choice of Medium. 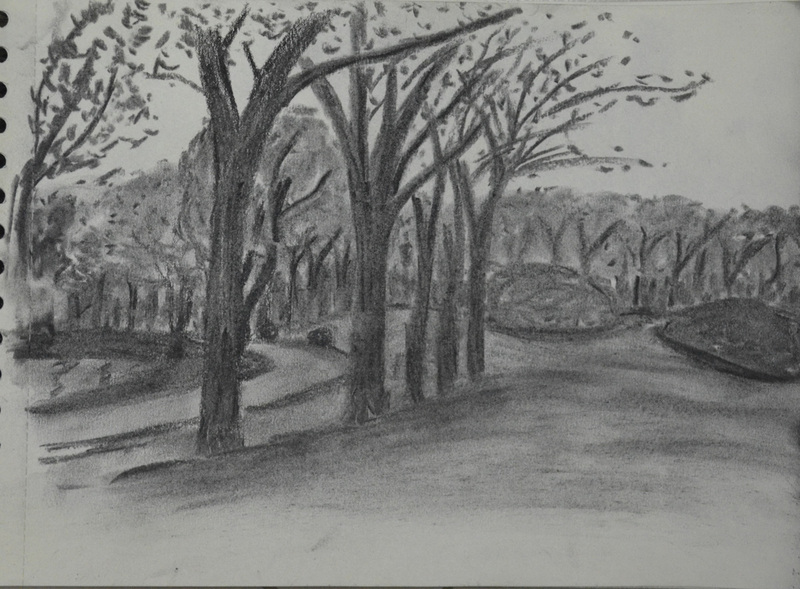 The fourth and final drawing, which I thought would be the easiest was left incomplete dead on 15 minutes and after going over it about three times in charcoal, the medium that I thought was the safest for this type of landscape given the 15 minute time frame. I am not impressed with my performance on this exercise, However I do feel that I have learnt something very important from it and that is choosing the right medium for the right job…the job being a 15 minute sketch in this type of environment. What I did like about this exercise though were the notable changes in the landscape just by shifting my view a little, I could have got many great and very different drawings just by sitting in the same spot. I took advantage of this by finding the focal points that I thought would be best to start from given the 15 minute time frames.